Here at Golant Bed and Breakfast we provide you with your own front door key so that you may come and go as you wish. We have a variety of rooms, from twin to double and triple. All our rooms are centrally heated for those winter months with TV and coffee making facilities. There are en-suite, some with shower. All rooms have their own washing area and shaver points. 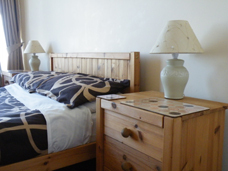 All our rooms are comfortably furnished, some with really great views of the cornish coast. There is also an ironing board, clothes line and needlework box, which you are welcome to use at any time. 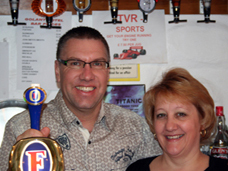 The Golant Bed and Breakfast has a private bar on the first floor which is fully licensed and tastfully decorated to ensure that you feel comfortable should you wish to join us for a quiet drink. We have a great range of drinks to cater for all and are happy to entertain you before a night out or even after last orders have been called in the towns bars. Many guests join us for a quick night cap to end the evening! Breakfast is served between 8:30 am and 9:30 am 7 days a week. 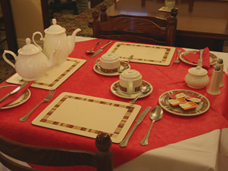 Breakfast is informal and and we will do our best to accomodate you with any special requirements you may have. We realise that you will have a full day ahead of you and therefore our breakfast is a Full English with tea, coffee and toast. Cereals are available every morning too.